Our One day course is designed to teach you the basics of servicing. 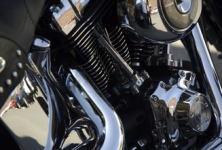 bike in a roadworthy condition by, for instance, being able to check and change fluids, oil filter, brake pads, adjust a drive chains etc but also find out what tools you will need and to take away all this information in your own manual. Please call for further details and course info if you are interested in learning what to look at to keep your bike in a safe and roadworthy state. Unlike a race team, your bike will likely be serviced by a single garage on an 'as needed' philosophy by yourself. Many riders have little regard for what's going on and leave a lot of maintenance until it is too late. A small overlooked problem can cause larger issues that could easily be avoided by simple interaction from the owner. Three of the easiest to spot and most overlooked are worn brake linings, Worn drive chain/sprockets and worn tyres. These are all essential to your safety, and yet so many people overlook them. In the case of a worn chain, you at least have the possible option to tighten it up. But too tight can cause damage elsewhere, too little and it can jump the sprocket, in a worst case scenario, a chain jumping its sprocket (or snapping) can destroy an engine casing (or even lock the rear wheel with potentially disastrous results). All the images below are of worn out components. Some of them are worn beyond belief. But always remember, a well maintained machine is not only safer to ride, but is also a more enjoyable ride. There is nothing worse than jolts, clicks and whines from components that should have been replaced, especially once you know how much damage those components are causing to other parts that would otherwise have lasted for a long long time. Make sure you don't risk your life doing the same.